Jordan Ayew's latest strike maintains his side's 95 per cent success rate, but which other clubs excel from 12 yards? News Cech: I have never had to wait so long! This week we are looking at the art of penalty taking in the Premier League. Swansea City may be in the bottom half of the Premier League table but they are top of the rankings when it comes to converting penalties. 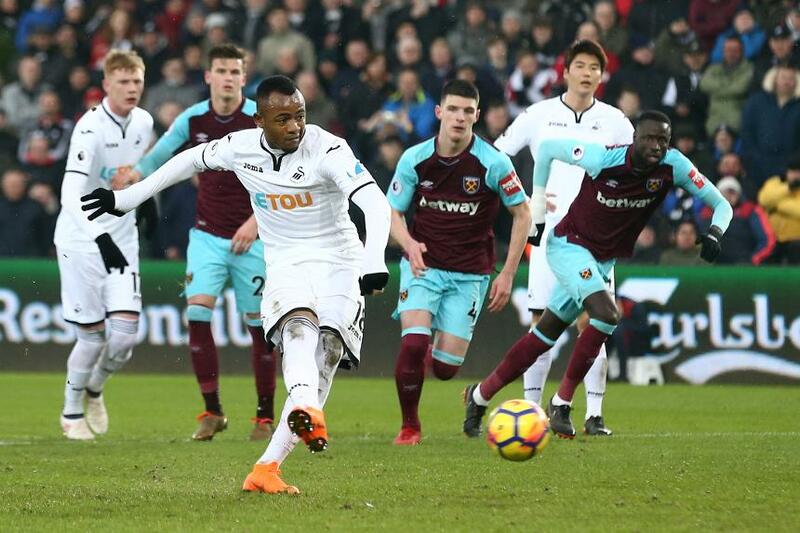 Jordan Ayew’s successful spot-kick in the 4-1 home win over West Ham United on 3 March continued the club’s impressive strike-rate from 12 yards. Swansea have been awarded 21 PL penalties and have scored from 20 of them, a success rate of 95 per cent. Southampton have been similarly ruthless. They have found the net with 62 of their 69 spot-kicks, a rate of 90 per cent. Watford are third. The Hornets have registered with 17 of their 19 attempts, or 89 per cent. Huddersfield Town could soon find themselves high up the list. The Terriers have netted both of the two penalties they have been awarded in the competition. Nottingham Forest are one of five former PL clubs in the all-time top-10 rankings. Their record of 89 per cent (16 out of 18) is narrowly better than fifth-placed Blackpool’s 88 per cent, while Birmingham City, Hull City and Reading have also scored more than 80 per cent of their PL spot-kicks.